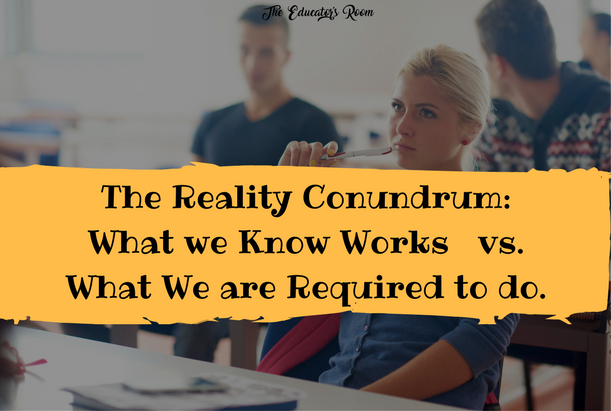 The reality is this: what we know works and what we are required to do as teachers often don’t align. The conundrum is how to choose. We want to choose what we know is best for our students 100% of the time. Sadly, our institutional inertia and regulation and testing means that too often isn’t possible. Last week, I was privileged to attend two professional conferences: Missouri Technology and Education Conference (METC) and Write to Learn. Both experiences brought this Reality Conundrum to the forefront for me. I learned so much my head hurt. Both events were incredible displays of awesomeness happening in classrooms right now. Many of the key note speakers and session leaders are nationally known figures: Dave Burgess, Kelly Gallagher, Nikki Giovanni, Nancy Frey, Yong Zhao. Many more were classroom teachers like me from throughout the region. All those things conferences are supposed to do for attendees happened for me. I felt uplifted, validated, encouraged. My perspective was broadened. I learned new strategies and tools and ideas I can try. Towards the end of the week, though, I collided head on with the reality conundrum. It was disheartening. Research and experience have concluded pretty unequivocally that students need to read and write more in less structured ways for authentic audiences. They flourish with choice and authenticity and relationships and positive classroom culture and student centered classrooms and developmentally appropriate materials and teacher modeling and creativity. But curriculum guides and requirements rarely respect the time for any of those things. I’m a pretty positive person, but even I struggle with the reality conundrum. Sometimes I just need a little naughty. Nikki Giovanni is an insightful, talented poet. She also has a bit of a potty mouth. There is something about being a little unrestrained, a little more relaxed, a little lighter, that makes laughter more cleansing than not. Even when the message is ultimately quite serious. Poetry feeds the soul and the soul needs feeding. Mostly, I cling to George Couros‘ tenant of innovating within the box. If we can just be creative enough, thoughtful enough, brave enough, we can find a way to infuse our classrooms with all those brilliant ideas. This is true, at least true enough to make it worth trying. The radical changes I believe should be made might have to be more incremental. I might need to ask for forgiveness a lot and hope no one notices I stopped asking for permission. I will need to fight the power in every small way I can. Maybe the only thing I can do is take heart from Yong Zhao‘s analysis of the international data showing that American schools are, in fact, pretty successful. Or at least, not nearly as good at beating the creativity out of our children. I am happy to contribute to that effort. It might be the realization that much of what needs changing will happen within the four walls of my classroom that keeps me going. There are things I can control. Maybe the tips I learned from Dave Burgess will help me teach a little more like a pirate, and in so doing, capture the minds of a few more students. Maybe Nancy Frey‘s assertion that we can and should have students write 5,000 (yes, I said 5,000) words a week is possible, with Kelly Gallagher’s help. Seriously, aside from the fact that he is an incredibly engaging speaker, Kelly Gallagher is also an amazing educator with easy to implement ideas. His website is a fantastic resource. If I can keep contact with others who are also positive, inspiring, willing to give new things a try, then there is hope. For me, this means not just attending conferences, but presenting as well. Partly, the possibilities for funding are increased by representing my school district in a positive light. Mostly, it is because creating presentation proposals forces me to reflect in a different way. I have to carefully consider what I am doing that works so well it is worth sharing. I have to muster the self-confidence to believe what I do is worth sharing. I have to consider what is replicable, applicable, reasonable, and meaningful for other teachers. My aspiration is to be as effective, innovative, and inspirational as the men and women who present at conferences are. If I could master the skill of changing hearts and minds, of challenging existing practices through example, without making anyone feel attacked, inadequate, or insecure, it is worth the hours, the nerves, and the trouble. The mood in my room would always be overwhelmingly positive. The Reality Conundrum is unavoidable. Some sacrifices will have to be made. But giving up is not an option for me. Refueling matters. There is a lot of talk about balance and self-care these days. I’d like to suggest that professional growth is an important part of self-care. I’d like to suggest that though the Reality Conundrum becomes more obvious in such contexts, so too, do the ways to choose better.